On the internet and most especially when you are an ebook, no-one knows you are a spine out title in a regular bookshop. No one checks your inside page to see your publication date or worries about your condition. In fact, if you have a nice cover, a good blurb, a sensible amount of meta data and a good price, you will be accepted along with the freshly published, the self-published and the badly published, just one more option in a vast sea of options. An almost perfect example of this is the Len Deighton novel I bought on my Kindle for my recent trip to LA. I wanted something with a spy theme or at the very least a good thriller. If I’d been in a bookstore, Deighton wouldn’t have had a look in, firstly because he would be unlikely to have any shelf space (despite a recent reissuing of the texts with damn fine covers), at best maybe a spine out copy or two and secondly because other, newer titles would have been calling out for my attention on tables and in 342 offers. Online however, I spotted the nice Deighton cover while browsing spy novels, I had just read a second-hand copy of one of his other books, liked that, liked the price and bought the book, deal done. That it was backlist didn’t matter, and except that I’d bought a paper version previously it might never have entered my head. There are lots of stories like that one online and what they mean is that new books have to compete directly with old books and especially when it comes to ebooks. The database brings the reality of competition with EVERY SINGLE BOOK EVER PUBLISHED into sharp focus for publishers as new books face increased real challenges from books published 10, 20, 300 years ago and in every conceivable context, on a phone, laptop, desk computer, iPad, iPod, wi-fi enable device, anything that connects to the cloud and has a screen (not to mention an increase in POD). So if the web enabled a flood of amateur (and let’s face it not always terribly good) content, Google’s books database enables a flood of real professional content that rings true with quality and which at a time when being published was harder than it is now has the stamp of publishers approval. This onslaught threatens directly the lifeblood of all publishing, the new book trade, in ways that all publishers rightly fear. The ebook sales surge, and the increased power this has given authors, combined with the new ability of backlist to ignore its status and sell to new (and old) customers makes it clear that the frontlist centric model of publishing is heading for a crisis. Of course, if publishers are smart (and many of them are) they will see that this competition presents opportunities for their enormous backlists, if they can just get them online and ready to sell. Right now authors, agents and estates seem to be the most active in the field (and I have a lot more to say about that), but that’s because most people haven’t head about Open Road Integrated Media (ORIM) and the crazy growth of its backlist based list. Open Road partners with authors, estates, and their agents to digitize, design, distribute, and market their backlist books electronically. In 90 days an author’s backlist works can be brought to market with new digital covers and promotional materials and made available widely on all ebook reading devices. Our distributors include Amazon’s Kindle Store, the Apple iBookstore, Barnes & Noble’s Nook store, the Sony Reader Store, Kobo Books, and Overdrive. Oh yes, ORIM knows what it is doing, knows what it wants and has been driving hard for about 18 months to get there. On the basis of a quick count ORIM will have published some 208 ebooks between January 2011 and May 2011 if it gets everything listed on the site out on time, adding to well over 1000 already published. Of course, it’s led by Jane Friedman and, as this New York Times piece makes clear, she’s no slouch. All of which goes to suggest that something big is happening slowly but surely to the shape of the trade book publishing industry. While we can expect ebook sales for frontlist titles to rise as more and more readers move online, as they become comfortable with their ereading and they begin to explore, we should also expect the long tail to do even better in ebook and digital format than it currently does in physical form, especially if the effort put into those titles is even a little more than nothing. I don’t know that it is a good thing or bad thing, I suspect, on balance it is a good thing, but I just don’t know for sure. One thing I do know is that it’s going to be very interesting indeed. Not a great day, but a good one! 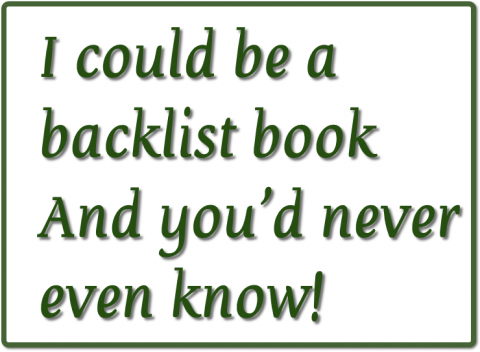 It is definitely an exciting time for authors and readers, as you say, especially authors with backlists. However having read your comments, I could not help coming to the conclusion that the essence of the change you mention (re backlists) is shelf space. It is not anything magic about the ‘nature’ of eBooks or digitisation. Do you really think that 99% EVER look inside a paper book to see the published date ? Hmmmm… I don’t. If back listed books were to appear on shelves I do not believe for a moment they would be noticed as such by the general public. Like the transition to digital in the music business, the ability to now (or soon, anyway) access virtually all backlisted titles with the same ease as new titles is a boon for the public as well as authors. It is a ghastly tragedy that throughout the age of paper, both great and good titles have disappeared from shelves for no other reason than sheer space and storage issues. Good and great writing has been dispatched to the dust and cobwebs of obscurity, and rendered invisible and inaccessible to hungry readers. Now every piece of good writing from those lost decades can rise from the dead and be enjoyed by millions of people all across the Globe, if someone will take the effort to do so. I’m just hedging my bets is all. I’m fairly sure it is for the best! As to the other points, yes, the internet is facilitating this change for physical books too, and I wasn’t leaving that out. But I do think that but the digital publishing facilitates cover changes, metadata updates, pricing experiments etc. to an even greater degree then physical publishing does even with the internet!